A 6.0 Magnitude Earthquake Struck In the Luzon, Philippines Region. | Chaos Sweeps Away the World We Know! The Disaster, current events & Catastrophe Blog. Forecasts for 2014 to 2022. Read tomorrows news today! Plus current economic, commodities, stock indices and financial news. ← Ecuador’s Mount Tungurhaua Volcano Erupts in Fiery Display. November 30, 2011 – A 6.0 Earthquake Struck Near Luzon, Philippines: A 6.0 Magnitude earthquake struck along the Philippines tectonic plate. The quake struck at 8:27AM local time, at a depth of 14 kilometers (9 miles). Due to the International Date Line, it was 7:27PM (Nov. 29th) in New York, 6:27PM in Chicago, 5:27PM in Denver and 4:27PM in Los Angeles. 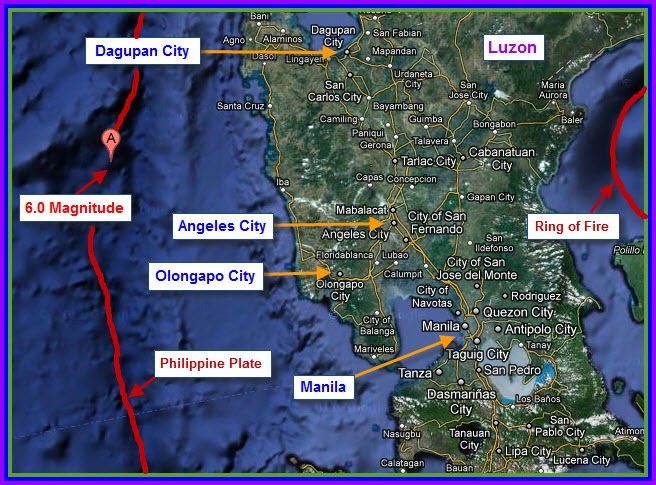 The tremor was located 95 miles WNW of Olongapo City, Luzon, Philippines; 96 miles WSW of Dagupan City, 104 miles WNW of Angeles City and 142 miles WNW of Manila (see map). This area is prone to earthquakes since it is the juncture of four major tectonic plates: (1) The Philippine plate, (2) The “Ring of Fire” Pacific plate, (3) The Eurasian plate and (4) The Indo-Australian plate. The Ring of Fire is so named because of high volcanic and earthquake activity, with over 80% of the major earthquakes and volcanoes occurring along its borders. This area is part of the southwest pacific region and is home to over 40% of the major earthquakes, great than or equal to 7.0 magnitude, that have occurred over the last 40 years. Out of the 346 major global quakes, 170 have occurred in the Southwest Pacific Ocean. Indonesia tops the list with 36, followed by the Solomon Islands – 19, Papua New Guinea – 16; the Philippines, Vanuatu and New Zealand – 14 each; The Kingdom of Tonga – 7, Fiji – 6, Samoa – 5, Guam – 4, Australia – 3 and New Caledonia – 2. The last major quake to strike the Philippines was on July 23, 2010 and was a 7.6 magnitude event near the Celebes Sea and Gulf of Moro. On March 5, 2002; a 7.5 magnitude quake struck near Mindanao; killing 15, injuring 104, destroying 800 houses and causing $1.7 million dollars in damages. This entry was posted in American Samoa, Australia, Earthquake, Events, Fiji, Indonesia, Misc, Miscellaneous, Nature, New Caledonia, New Zealand, Pacific Ocean, Papua New Guinea, Papua New Guinea, Philippines, Ring of Fire, Samoa, South Pacific Ocean, The Kingdom of Tonga, The Ring of Fire, The Solomom Islands, Vanuatu, Volcanoes and tagged A 6.0 magnitude earthquake struck near luzon philippines november 30 2011, american samoa, angeles city philippiines, Australia, dagupan city philippines, fiji, guam, indonesia, july 23 2011 7.6 magnitude earthquake near hte celebes sea and gulf of moro, manila philippines, march 5 2002 a 7.5 magnitude earthquake struck near mindanao killing 15 injuring 104 destroying 800 houses and causing $1.7 million dollars in damges, new caledonia, new zealand, olongapo city luzon philippines, pacific tectonic plate, Papua New Guinea, philippines tectonic plate, samoa, the eurasian tectonic plate, the indo-australian tectonic plate, the kingdom of tonga, the master of dissater, the philippines, The Ring of Fire, the solomon islands, the southest pacific region is home to over 40% of major global earthquakes over the last 40 years, vanuatu. Bookmark the permalink.